Generally jute sacks are large jute bags in cylindrical shape which are used to store and carry eatables(like rice, sugar, wheat, floor, etc. ), vegetables, fruits, other food grains, and any other kind of material in large quantity. These eco friendly jute sacks come in various sizes and quality as per the different requirements. When jute production started a hundreds of years ago it was jute sacks and jute ropes which were produced initially, and since then these bags have not lost any popularity and are still popular with that very same degree. Fine quality and strong jute fibers are used to make jute sacks as these are made for rough and tough uses. Jute sacks are also known as burlap sacks, hessian sacks and gunny bags. Governments of many countries have also directed their respective states to use jute made sacks only to store and transport agricultural commodities. The cost of such sacks is not high, though many of the states have started to provide subsidies on jute sacks thus giving a big boost to their production and jute industry. Involvement of various governments in this issue proves the usability and benefits of eco friendly jute sacks for pollution free environment and sustainable development. Each year lakhs of tons of food grains, vegetables and fruits are produced and lakhs of bags are required for storage and transportation, and this requirement is fulfilled by the jute sacks, which are produced on a large scale worldwide. This way jute sacks also contribute to save our environment which otherwise would be polluted by the lakhs of plastic bags used to store agricultural commodities and other stuffs as after disposing these plastic bags do not decompose and just add a huge quantity of non biodegradable litter to our environment. On the other hand jute is 100 percent bio-degradable and eco-friendly and does not cause any kind of harm to our environment. Jute sacks are resistant to wear and tear up to a large extent thus they are known for their high strength and heavy duty. They are also available in very large sizes to carry large quantity of goods. The life of jute sacks is long so they last for long. As jute is totally biodegradable and environment friendly, so after their full life they do not become burden on the planet like the plastic products wastes. 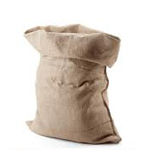 Jute sacks are available in different sizes and types such as small jute sacks, large jute sacks, heavy duty jute sacks, hessian jute sacks, rice jute sacks, sugar jute sacks, etc. Where to Buy Jute Sacks? 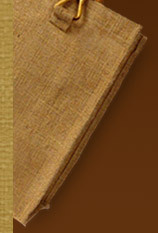 Today most of the jute manufacturers and suppliers provide jute sacks in different sizes, strength, designs and colors. You can also contact us to buy or for more information on jute sacks, heavy duty jute sacks, jute sack bags, large jute sacks, small jute sacks, hessian jute sacks, burlap sacks and gunny bags.